In North America, aluminum strip is the predominant choice of winding material for low-voltage, dry-type transformers larger than 15 kilovolt-amperes(kVA). In most other areas of the world, copper is the predominant winding material. The primary reason for choosing aluminum windings is its lower initial cost. 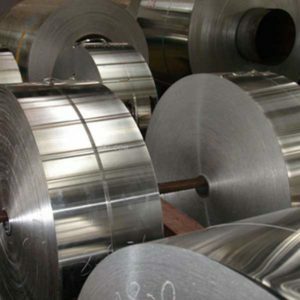 The cost of copper base metal has historically proven to be much more volatile than the cost of aluminum, so that the purchase price of copper conductor generally is the most expensive choice. Also, because aluminum has greater malleability and is easier to weld, it is the lower-cost manufacturing choice. However, reliable aluminum connections require more discipline and expertise on the part of transformer installers than that needed for copper connections. What type of aluminum strip used for Dry Type Transformers? Of course, also can according to customer requirements, but most of the purealuminum strip 1060… 1070 personal feeling should be a good point, because the proportion of high point, conductive performance certainly a little better, but currently on the market do we use are. This entry was posted in aluminium strip and tagged aluminum strip, Dry Type Transformers. Bookmark the permalink.